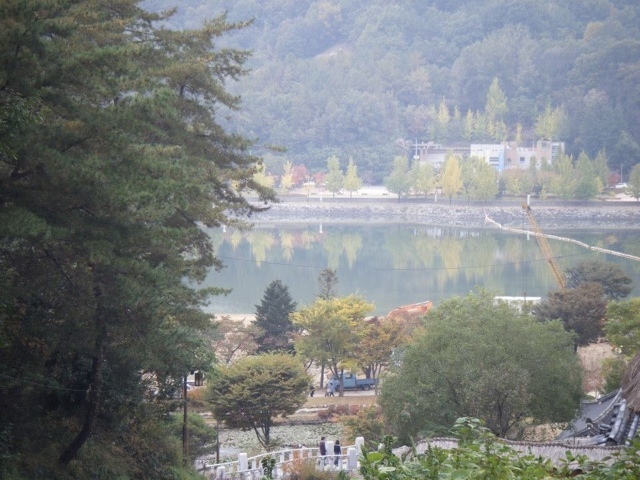 One of my first adventures outside of Busan and Gimhae was to the city of Andong. 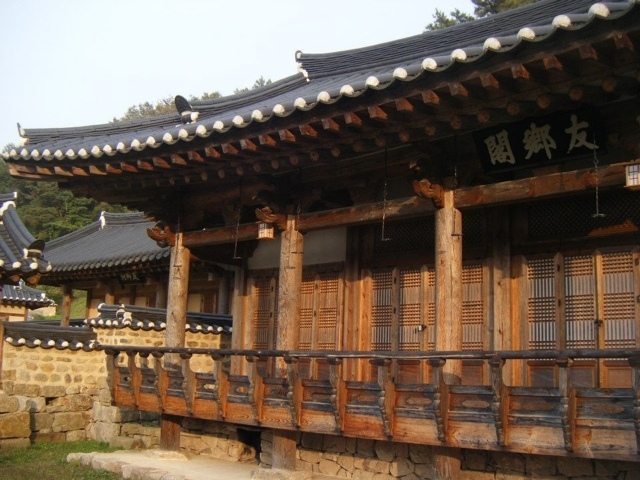 Andong is a city of about 170,000 souls located in the Gyeongsangbuk-do province and is widely known for preserving the cultural heritage of Korea. 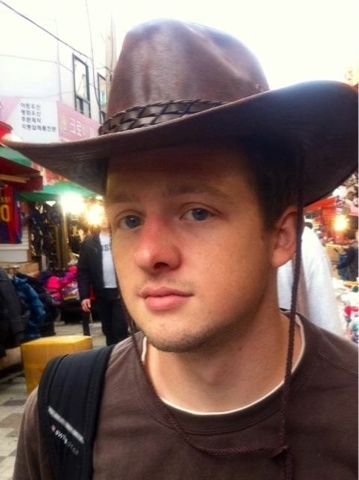 I was asked by a coworker/friend to accompany him on the journey. With nothing else to do and the promise of seeing some unique things I decided it was a good plan of action. We left early in the morning and took the rail to the train station. It was to be my first time riding the KTX (the Korean bullet train). We were both lively souls before getting on the train and were singing Harry Belafonte's smash hit "Banana Boat Song (Day-O)" to the puzzled looks of Koreans passing by. The ride wasn't more than two hours which passed quickly by as the train flew through the countryside. 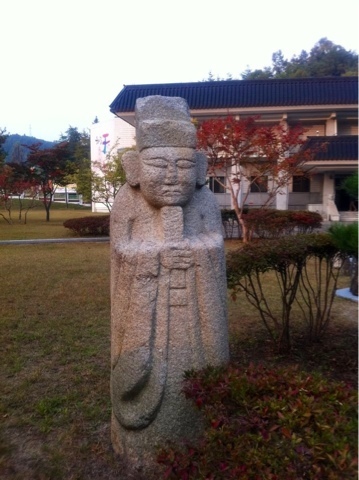 We arrived at the station and began looking for our first place to visit, The Andong Folk museum. Well as things would have it we got off on the wrong stop. We ended up walking a little over three miles through the city until we reached an area we could catch a cab. At one point along our trek we passed by two Korean children who emphatically kept repeating "get some!" until we had passed them. 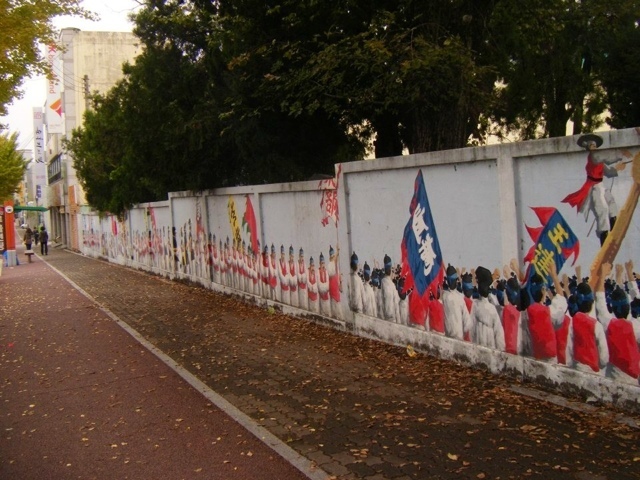 Along the way we viewed spectacular murals lining the main street depicting traditional Korean games. I thought it was an interesting way to liven up a rather typical Korean roadway. Though I'm still am not quite sure what this game was about but i think it had something to do with one of the men on the poles falling off. Eventually we finally arrived at the museum. 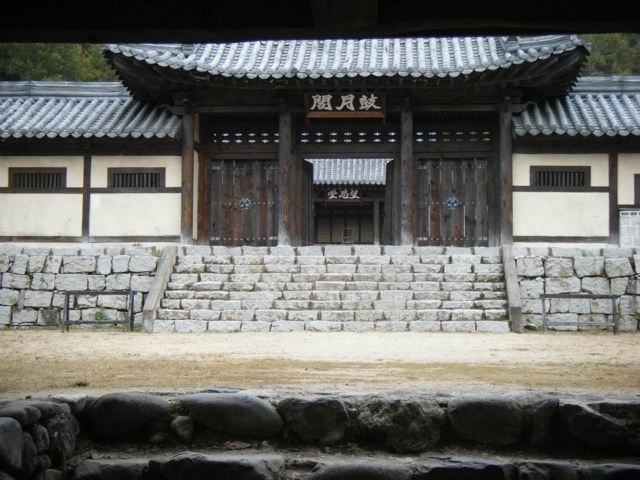 This museum consists of two parts: an indoor exhibit portraying the lives of Koreans during the Joseon Dynasty (1392-1897) and an outdoor portion depicting houses and buildings of roughly the same time period. It was a delightfully entertaining way to explore a culture and time now long since passed. Inside the museum there was information on everything from child rearing, cooking, weddings, traditional clothing, Confucianism and other spiritual practices. Two of the most interesting things I learned were as follows: The rather abundant use of hemp for making ropes and clothing and the ritual of praying to phallic rocks by pregnant women wishing to have a boy. 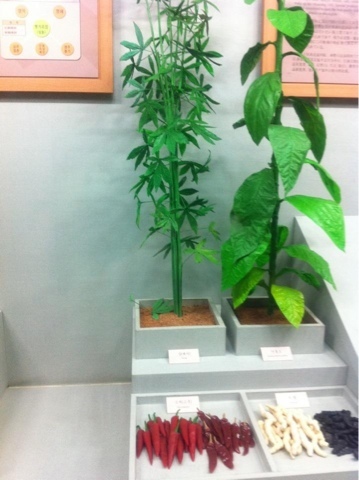 To this day both of these activities are still practiced, hemp fields abound in the countrysides of Korea, though the latter being less used in modern times. The next leg of the museum led us back outdoors to view what life had looked like for village people during this time. The entrance to this portion of the museum was guarded by giant totem pole like statues. I never received the full explanation of this structures but the short English explanation said they were to guard against evil/bad spirits entering villages. With their fierce faces and their height of giant proportions I think they could work! 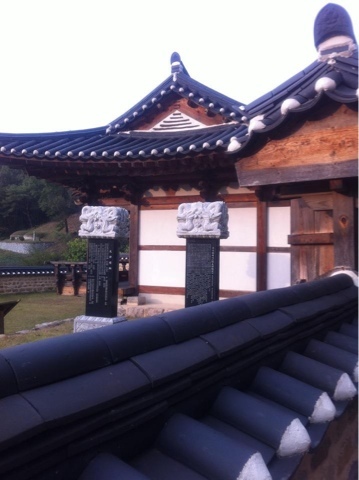 This lovely folk village was build alongside a man-made reservoir helping to dam the Nakdong River. 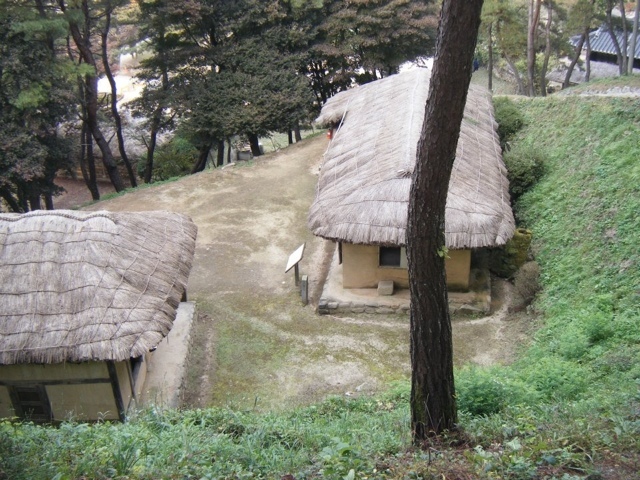 It adds a striking contrast when viewed from the upper parts of the village. As we meandered through the village I was stricken with the feeling of being one of the last people on Earth... Who just happened to travel back in time. The buildings were only meant to be informative and without people inhabiting them it added a certain level of creepiness to them. 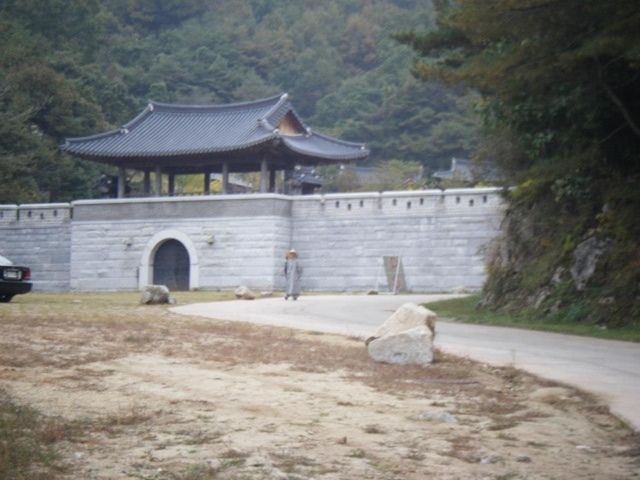 It was as if they were the remnants of some ghost town in old Korea. Of course there were a few other tourists exploring but we hardly ever crossed paths. 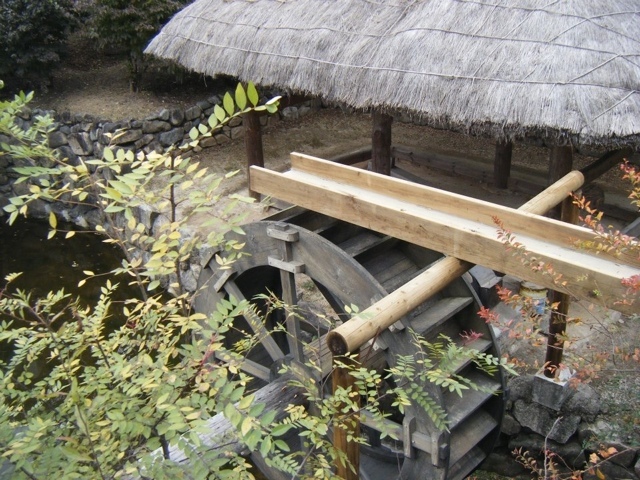 We saw the old thatch roofed houses, a water-wheel used for milling and small government buildings. 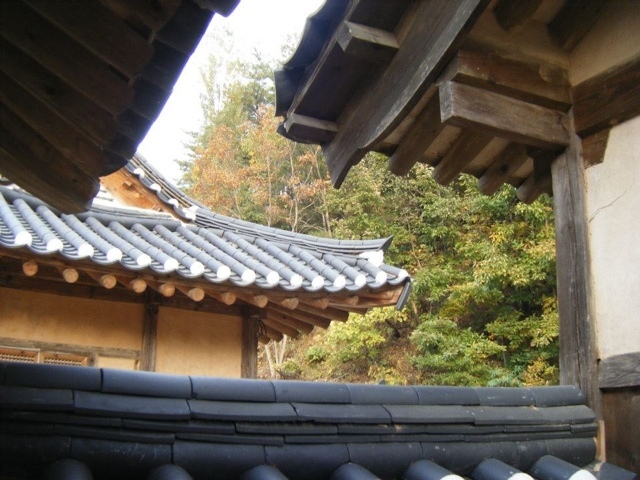 The larger of the buildings always used more expensive materials such as a lumber facades, masonry and tiled roofs. 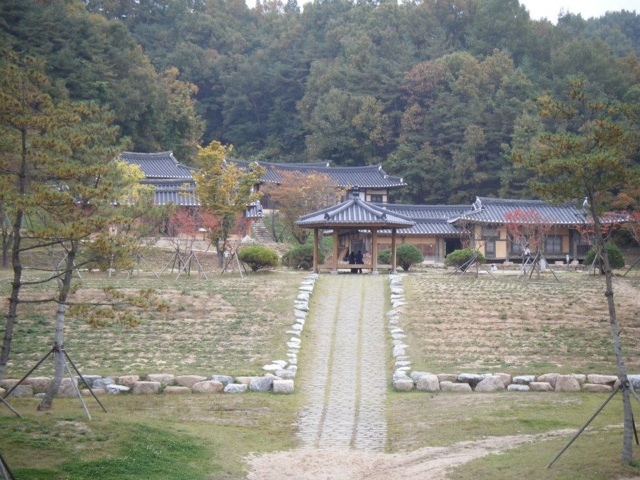 Eventually there was a break from the "lower village" into the "upper village" I can't be certain (due to the complete lack of informative signs) but I think it was meant to signify one of two things; the lives of the average people in comparison to the elite of society or the evolution of architecture during the Joseon Dynasty. The entrance to the upper village was heavily fortified by a large gate. There were also many places in which soldiers of the past could stand guard without being seen from the outside. Inside of the wall there was a guard tower, a garden, and other buildings of better quality. We even happened upon the what appeared to be the house of a governor or important government official. 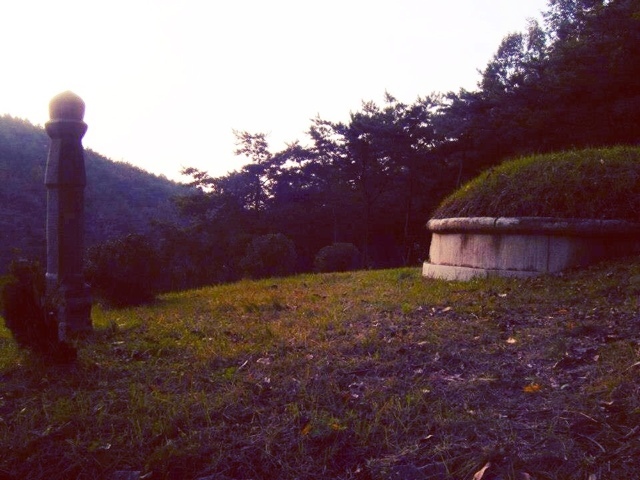 Eventually we passed the village only to wander into the mountains to find an old burial mound. 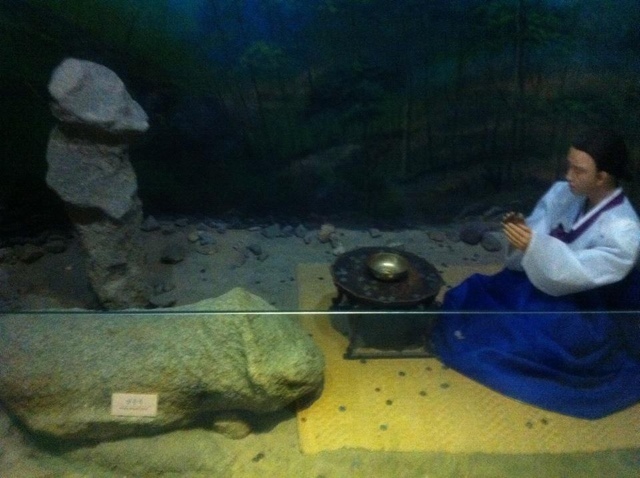 In Korea they often dig a shallow hole, place the body in and then cover it with a large mound of dirt. It is comparable to graves in America with one rather noticeable difference; where our graves are flat theirs are mounds. Sometimes these mounds are little bumps which are hardly noticeable; though other times, especially for historic figures such as kings, they are huge mounds that could be considered hills. From there we found the entrance to a newly paved road leading back into the city. 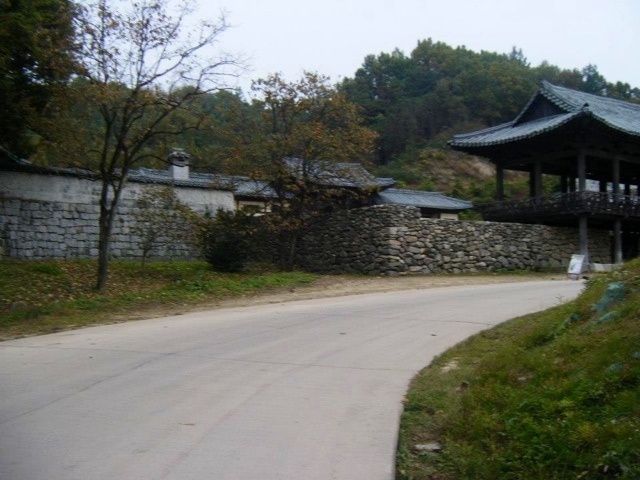 We decided it was time to head back to the village entrance and eventually back to Andong. 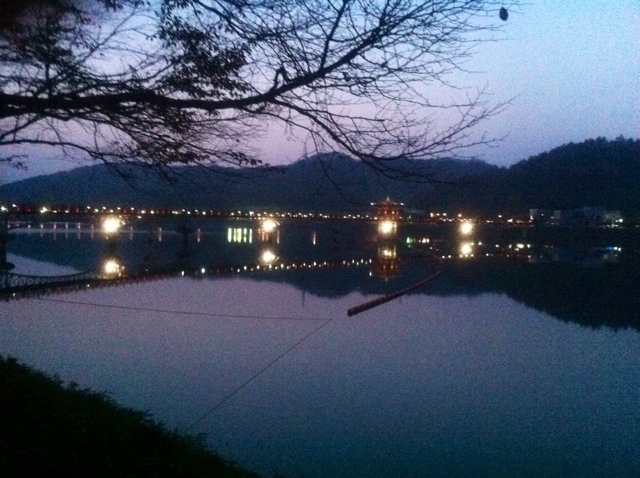 Once we arrived at the bottom of the hill we decided to travel across the reservoir using "Moonlight bridge." 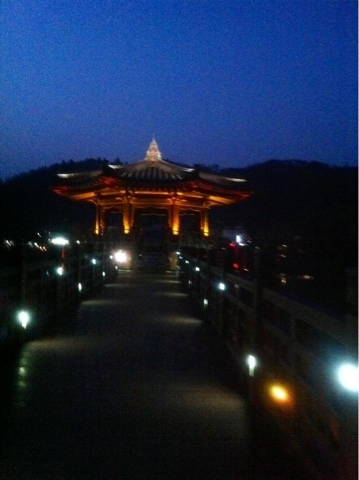 It is a beautiful bridge to view at night. Once we reached the other side it was already dark. And of course there were no taxis to be taken. 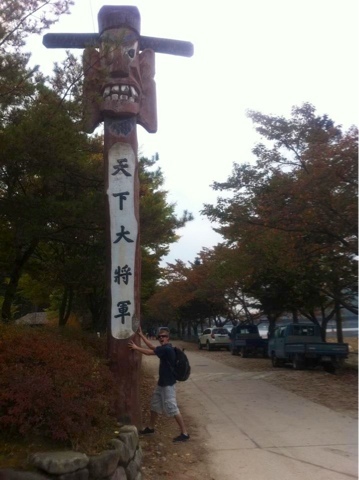 So again we trekked back into Andong city. By this time my feet were killing me and my stomach was ready for all the kimchi and beer it could hold. 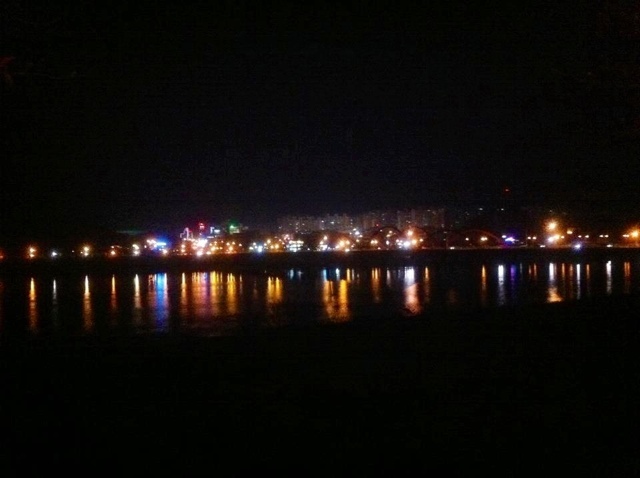 Before entering the city limits we were able to view the city scape at night. Even with all the love hotels lighting up the night sky it was still a lovely view. We finally reached the city and found a chicken joint. It was located near the top floor of a multistory building which lacked sufficient lighting in the stairwell and at one point had a blockage of rubbish blockading the path upwards. Once inside we indulged in fried chicken and beer. In the booth in front of us was a table of young college age Koreans. Actually the entire place was filled with Koreans but this group just happened to be within range. I dared William to try and hit on one of the women at the table thinking he wouldn't possibly do it. The wager was 1,000 won ($1 USD). Low and behold he finally got the courage up (after nearly an entire pitcher of beer). He turns around, taps one on the shoulder and speaks poor Korean to them. What did he say? It was something along the lines of "You and me. Hotel now." Well, it didn't work. Actually they broke out in awkward laugh and she politely said no. The rest of the evening we continued to get sideways glances from them and their friends. After the meal and beer it was time to head back to the hotel to crash. 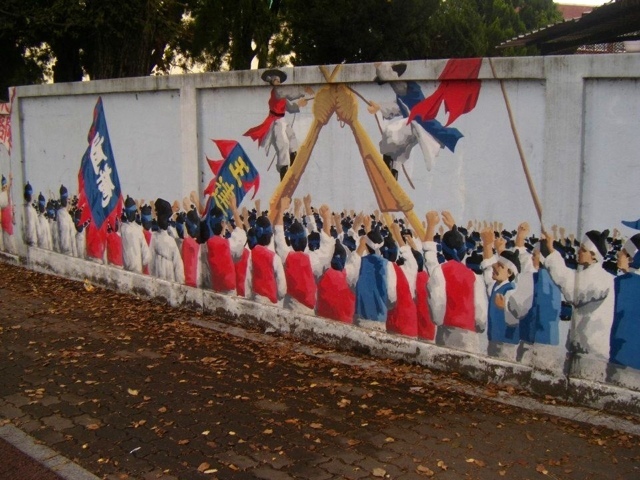 The next day we were to set out on the next adventure to Teogye's Confucian School.